But this isn’t the first time the networks have channeled the worries of liberal pro-abortion groups about a Democratic President’s Supreme Court nominee. 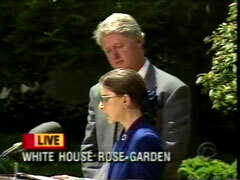 Sixteen years ago, President Clinton picked the solidly liberal Ruth Bader Ginsburg, an ardent feminist, to replace Justice Byron White. Ginsburg is probably the most liberal justice on the Court, but the networks conveyed doubts about whether she would really be a solid liberal vote on abortion. RITA BRAVER: Sixty-year-old Judge Ruth Bader Ginsburg has been an appeals court judge for 13 years. She's considered moderate to liberal, but today she cited this guide to judging from ultraconservative Chief Justice William Rehnquist. The next morning on CBS’s This Morning program, co-host Paula Zahn hit a pro-Ginsburg guest from the left: "The National Abortion Rights Action League is not totally comfortable with this nomination of Judge Ginsburg. They do not feel that she supports Roe v. Wade fully. Are their fears justified?" Over on NBC's Today, Katie Couric voiced similar fears to White House Chief of Staff Mack McLarty: "So you don't think she has an open mind in terms of interpreting Roe v. Wade, as some abortion rights activists are concerned about?" Of course, network coverage that indulges left-wing worries about a liberal President’s Supreme Court choice means even less time for the far more likely concerns of pro-life groups that Sotomayor will be a reliable vote to perpetuate the liberal status quo of abortion on demand.